One-size-fits-all hooded poncho (35x47inch.) for unexpected downpours. Conveniently compact container hooks onto a keychain, fits into a small pocket and is a great add-on to any bag or drinkware piece. I liked that it was actually nicer in person than in the photo. Very happy with it no complaints at all. Well made. I'm glad that your graphics department can work with the artwork as it was submitted. Perfectly done. We used these for give aways at a security fair to advertise Motorcycle Safety,they went so fast. 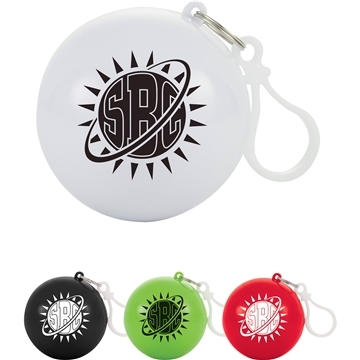 these were a neat idea for giveaways. Wonderful job on the imprint. Rosa is a pleasure to work with since she goes out of her way to get the job done very well and on time.